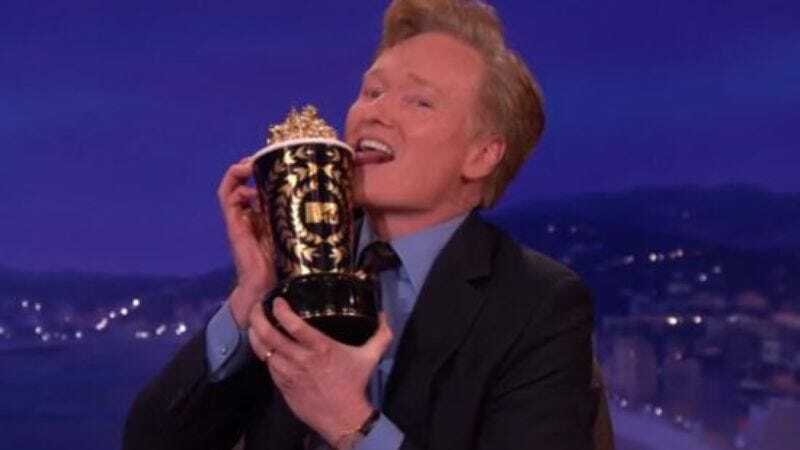 Movie awards season is not yet over until someone tries to talk about 12 Years A Slave to an auditorium of hysterical teenagers, and that duty shall fall upon Conan O’Brien, who’s been named host of this year’s MTV Movie Awards. O’Brien, who twice-hosted the Emmys and the White House Correspondents’ Dinner, will preside over all-new levels of pettiness on April 13, emceeing a night of assaying the year of important cinema so that we may know, once and for all, who among it had the Best Kiss. O’Brien will also probably make a joke about Jay Leno trying to steal his gig, to be greeted by someone randomly shrieking, “I LOVE YOU JENNIFER LAWRENCE!” Good luck to Conan in this, the world of the cineaste.